Yusitero Nakagawa, who was imprisoned by the Red Army in Sakhalin, chose to settle down in the Soviet Union. Rossiyskaya Gazeta caught up with the 88-year old farmer who is called Uncle Sasha by his neighbors, and was presumed dead by the Japanese. 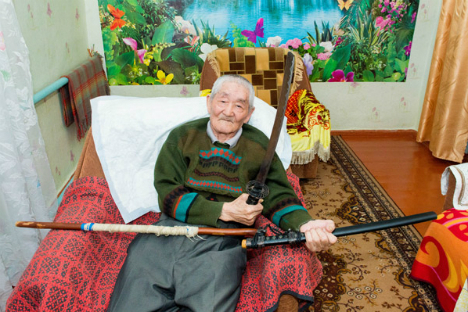 In the small settlement of Yuzhnoye, tucked away among vast Kalmyk steppes, everybody knows 88-year-old Uncle Sasha, although few of his fellow villagers know how to pronounce his real name. Uncle Sasha is in fact Yusitero Nakagawa. We met Uncle Sasha-Yusitero in his well-tended kitchen garden. Despite his advanced years, he still spends a lot of time working in his vegetable patch and is quite a master with his hoe. He is dressed in a khaki quilted jacket, an old well-worn cap, and rubber boots… And yet, part of him still looks like a hard-working Japanese farmer, unhurriedly tending to his paddy field. An ethnic Korean interpreter mixed up the Japanese prisoner’s name, and that’s how Yusitero became Sadao and was later renamed Sasha. Paradoxical as it is, Yusitero has fond memories of the time he spent in prisoner camps, felling trees or building roads. Yusitero did not want to go back to Japan. He feared being given a hard time for having managed to survive in captivity. Fate may have helped him make up his mind. When Japanese prisoners were freed in 1949, he fell ill with a complication from an old wound. “I nearly died in hospital. I was very, very ill,” Yusitero recalls. He was saved by a Soviet doctor, who nursed him like a child. “My dear doctor,” Yusitero calls her tenderly. They fell in love. In gratitude for saving him, Yusitero presented the woman with the only valuable thing in his possession, his gold dental crowns. There was no longer any question of him leaving the USSR. The former Japanese Army officer adopted the citizenship of the country he used to fight against. Fascinated by the vastness of his new land, Yusitero began to explore it. “I travelled a lot, I worked a lot. I visited the Far East, Siberia, Uzbekistan, Dagestan, Stavropol Territory,” he says as he counts them on his fingers, and laughs as he loses count. Even his savior doctor could not cope with his obsession with travel. They separated. Yusitero soon met another woman and they got married. They had a son and a daughter. However, his new family did not follow the samurai either when he set on a new journey of exploration of the Soviet Union. After years of travel, Yusitero settled in Kalmykia. Incidentally, among the locals Sasha has the reputation of being the luckiest fisherman. Getting him to teach you to fish is considered a great honor. When the construction of the reservoir was over, Yusitero got married again and found a job servicing the dam. One year, he was the first to spot a dangerous leak and saved the dam from a breach and nearby villages from flooding. Another time, a group of drunken men wandered to the dam. Three of them became unruly, climbed over the barrier and tried to enter the control room. Uncle Sasha, who was already 67 at the time, tried to reason with the uninvited visitors. In response, they hit him. But they clearly did not know whom they were dealing with. An old samurai is still a samurai. Already as an old man, Yusitero decided to visit Japan. The arrival of a kamikaze samurai who was presumed dead created quite a stir. It was only with a DNA test that it was possible to prove to the Japanese side that Uncle Sasha from Russia really was Yusitero Nakagawa. “I met my relatives and senior officials, drank sake with a Japanese minister, I even visited my own grave,” he says.